Abilene district roads will be pre-treated by TxDOT ahead of possible wintry weather. Texas Department of Transportation crews will pre-treat roadways in the Abilene District Friday morning in preparation for winter weather that could impact the area Friday and Saturday. 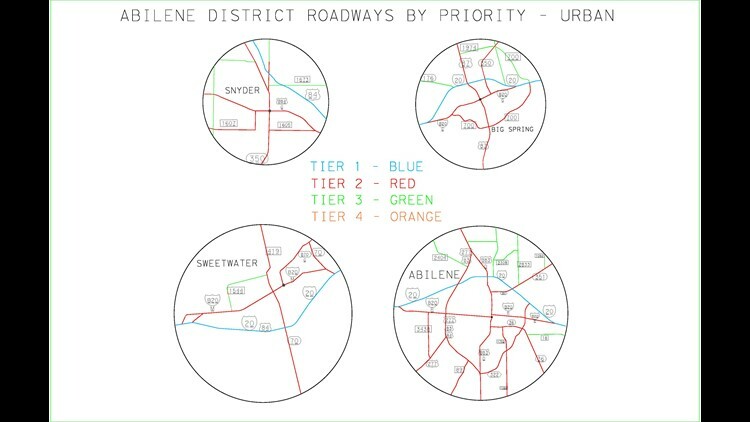 Crews across the 13-county Abilene District are treating Tier 1 and Tier 2 roadways, which include high-traffic corridors such as Interstate 20, U.S. Hwy 84 (from Roscoe to the Garza County line), U.S. Hwy 83/84, and U.S. Hwy 277, among others. The department says the brine mixture will keep ice from forming on roadways and structures as wintry precipitation begins to fall. The district said it is working closely with the National Weather Service to monitor weather conditions. “Safety of the traveling public is TxDOT’s priority, and crews will be working in shifts around the clock to prepare for and respond to any wintry weather that moves into the district, monitoring and treating roadways as needed,” a TxDOT release said. For real-time roadway conditions, go to DriveTexas.org or follow @TxDOTABILENE.